BrainSell Technologies announced today their vending partnership with Colosa Inc.
We look to ProcessMaker as an agile software suite that integrates seamlessly with some of our most popular CRM, BI and ERP platforms, specifically SugarCRM.” – Jim Ward, President and CEO of BrainSell. BrainSell Technologies is pleased to announce a newly formed partnership with Colosa, Inc. As part of both companies’ ongoing commitment to the business process, BrainSell will be providing turnkey integration and 1st level support for Colosa’s flagship software suite, ProcessMaker. 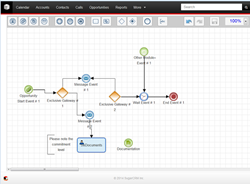 ProcessMaker is an open source suite supporting all levels of business process management. As a new member of ProcessMaker’s Partnership program, BrainSell will join at the Elite Partnership Level. In order to become a ProcessMaker Elite Level Partner, Colosa requires at least one engineer to pass the ProcessMaker certification exam. Integrating ProcessMaker functionality and maximizing business return is at the forefront of BrainSell’s partnership role. BrainSell is certifying two engineers now with two more on board this summer. “BrainSell is honored to be an Elite Partner of Colosa and wishes to be part of Colosa and their expanding commitment to workflow and the business processes. We look to ProcessMaker as an agile software suite that integrates seamlessly with some of our most popular CRM, BI and ERP platforms, specifically SugarCRM.” – Jim Ward, President and CEO of BrainSell. ProcessMaker is designed to integrate across a variety of CRM platforms (such as SugarCRM) and has simple, agile solutions and display charts for a variety of business process applications (such as the client approval process). ProcessMaker is available as a standalone BPM suite or integrates out of the box with some of BrainSell’s most popular CRM and ERP software.